Exquisite Luxury by Dransfield & Ross Zebra Bird Breakfast Down Feather Throw Pillow with Raised Beading. Lovely Shades of Tan /Ecru/Ivory. From the Zebra Collection. Commonly featured in Neiman Marcus. Ralph Lauren New Bohemian Black Beaded 15 x 20 Throw Decorative Pillow New A chic palette of black and rich purple is exquisitely detailed with elegant jet beading and intricate embroidery. Timeless paisley gets a new edge when paired with bold leopard for a stylish juxtaposition of masculine and feminine. The items included in this listing : 1 Black Beaded Decorative Pillow THROW PILLOW 15 x 20 MRP $220 Imported. Beaded Soft Velvet Rectangle Accent Throw Pillow Cover, 20x12, Teal Blue *Pillow is not included. All our products are handmade, one piece at a time and actual product colors may vary slightly from colors shown on the image. Velvet and gems – this understated elegant pillow adds a touch of class on its own or with a group of decorative pillows in your home. Made from 100% Polyester, the pillow case has been handcrafted in India and imported. ---Color: Teal Blue ---Trim: Purple ---Dimensions: The case comes in 12x20 inches. FREE GIFT: As a thank you for being a Pink Champa customer, we’ve added a vibrantly colored re-usable cloth pouch that can be used to store so many things. 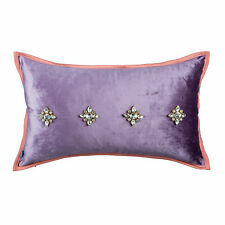 Beaded Soft Velvet Rectangle Decorative Accent Throw Pillow Cover, 20x12, Purple *Pillow is not included. All our products are handmade, one piece at a time and actual product colors may vary slightly from colors shown on the image. Velvet and gems – this understated elegant pillow adds a touch of class on its own or with a group of decorative pillows in your home. Made from 100% Polyester, the pillow case has been handcrafted in India and imported. --- Color: Purple --- Trim: Pink --- Dimensions: The case comes in 12x20 inches. FREE GIFT: As a thank you for being a Pink Champa customer, we’ve added a vibrantly colored re-usable cloth pouch that can be used to store so many things. 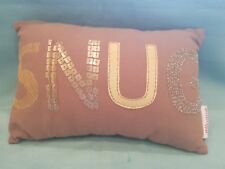 Beaded Soft Velvet Rectangle Accent Throw Pillow Cover, 20x12,Light Golden Green *Pillow is not included. All our products are handmade, one piece at a time and actual product colors may vary slightly from colors shown on the image. Velvet and gems – this understated elegant pillow adds a touch of class on its own or with a group of decorative pillows in your home. Made from 100% Polyester, the pillow case has been handcrafted in India and imported. ---Color: Light Golden Green ---Trim: Purple ---Dimensions: The case comes in 12x20 inches. FREE GIFT: As a thank you for being a Pink Champa customer, we’ve added a vibrantly colored re-usable cloth pouch that can be used to store so many things.